When I asked Antonio Ghini what the Maserati factory was like when Ferrari took it over, he holds his head in his hands, smiles, and after a pause says, 'It was a mess.' Given that Ghini is communications director at Ferrari and Maserati and that, being a PR man, he is not one to issue negatives about those for whom he works, we can take it that we're dealing with a grade one mess here - a mess resulting from years of insufficient money, management effort and morale. 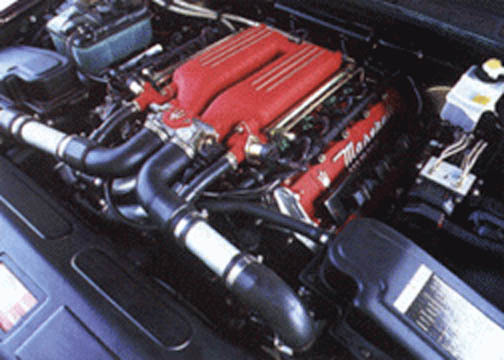 Since Ferrari came along in July last year (when Fiat group managing director Paolo Cantarella insisted that Ferrari take operating control of Maserati from Fiat Auto, which had run the company for the past four years) there's been a lot more of the first, plenty of the second and, as a consequence, an escalation of the third. So, how big was the mess? Maserati's Modena factory was old, peeling, dark and dirty, and by all accounts equipped with a lot of kit that would have been new when your grandfather was a working man. Cars came out of the gates, but, as most of us know, they were not of your finest quality, even if they were always quick. Fiat Group's contribution to the company's gradual regeneration has been to bankroll the exercise; more specifically, Fiat Auto, the car division, overhauled the Quattroporte for its third birthday last year, with an eye to improving quality and reliability. But these second-generation Quattroportes are going to be rare animals, because three months after Ferrari took over it decided to shut down production of the car altogether, in order to tear out the production line, install something modern and give the factory a lick of paint. More than a lick, actually - gallons must have been got through, coating everything from the exterior walls to the floor of the engine assembly room. There's a new blue 'Maserati' sign on the factory roof now, and an air of quiet purpose about the place that has been absent for years. Things are going on. Quattroporte production is slowly building - currently they're turning out two a day, but this will soon climb to 10 - and the new coupé, out later this year, was to be seen flitting about the plant, heavily disguised. It's said to be very pretty, and looked handily compact and muscular beneath its plastic cladding. It will be built on the new production line together with the Quattroporte, the first examples of which are emerging now. That line is impressive (very impressive if you're a long-serving Maserati worker), mainly because it's shiny, new and appears well organized. More to the point, production is arranged along the same lines as the Ferrari factory at Maranello, where cars of very high, if not unimpeachable, quality emerge. So there's more than idle reason to expect Maserati to turn out cars of High quality too. But what of the car itself? Well, it looks pretty much the same. Points of identification for the keen include reshaped door mirrors and, more explicitly, 'V8 Evoluzione' badges on the front wings. 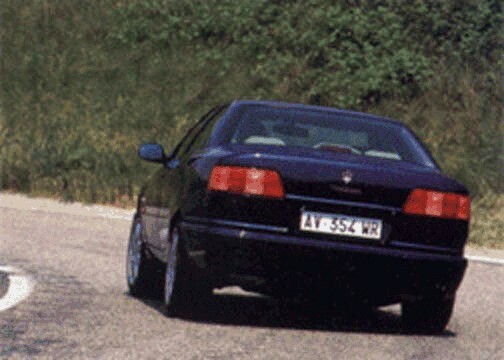 The super-keen might notice that, miracle of miracles, the body panels align very tidily, and that the paint as a mirror sheen unlikely to be found encasing an early Quattroporte. Yet beneath the surface, there are scores of changes - indeed, around 400 parts have been redesigned, and another 800 have been improved. New, for instance, are belt drives for the ancillaries, the cylinder heads of the V8, which have been redesigned (again) for quieter high-speed running, the quest for which is aided by the more tightly assembled body. That's just a sample. Among the visible changes are new seats with more adjustment in them, new briarwood trim for the interior, new instruments with a built-in outside temperature gauge, now push-buttons for the minor controls, a new steering wheel and a new clock. Yes, the rather ornate Swiss chronometer that was the centerpiece of every Maserati, has gone. It was, says MD Paolo Marinsek,' too much a symbol of the De Tomaso era.' Such an attitude seems a bit petty, and it's even sillier when you realize that the replacement is a tuppenny-ha'penny digital clock rendered unreadable by a combination of its location - down by the gearlever - and bright sunlight. What were they thinking of? 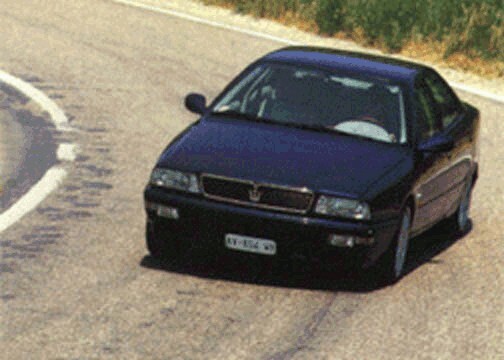 But don't be disheartened, because there's no doubt that this Quattroporte is a Better Car. You notice it immediately with the doors - 'They clunk, rather than kerbam shut,' said one Maserati employee - the smooth paint, and the wood, which looks like it was fashioned by someone possessed of more than rudimentary cabinet-making skills, in contrast to the previous QP. 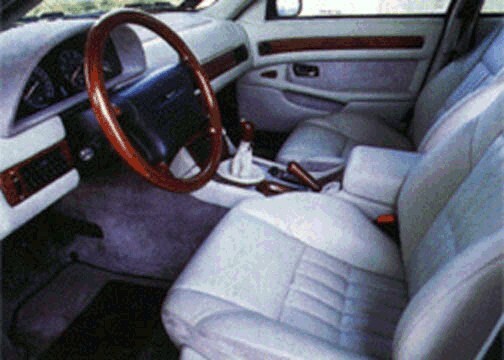 Sink into your leather chair and you'll discover that, provided you can insinuate a hand between door and electric controls (the gap is tight), it's possible to maneuver your body into a comfortable position relative to the pedals, although the wheel is still a stretch. 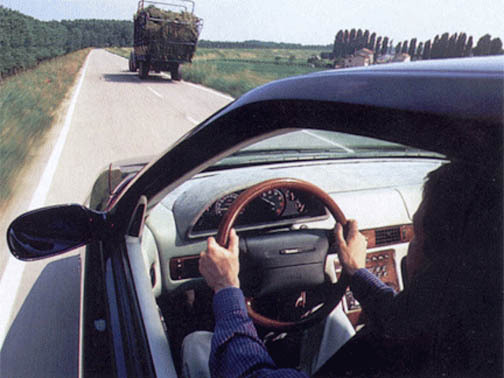 But, be in no doubt that you are in a luxury car - sumptuous and extravagant materials abound. Alcantara mock-suede dresses the ceiling, the facia, the instrument binnacle hood, parts of the doors and pretty much anything else that isn't faced in wood and leather. 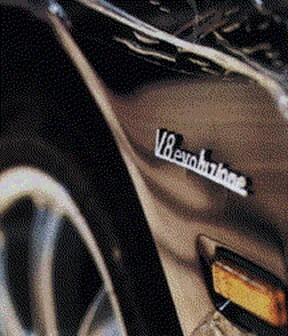 Fire the V8, and it idles quietly. But it doesn't take long to discover its potency, gentle pressure on the accelerator revealing a car that just wants to bound away. But first, we must leave the factory, and Modena, for the autostrada. That journey's long enough to demonstrate that it's reasonably easy to master clutch and gearchange (this car is a six-speed manual - a four-speed auto is optional) for a smooth advance, and that it's not impossible, when sitting at the lights, to engage reverse, which is parallel to first, and give the guy behind you a fright, which I did. I'm pleased to say that a Maserati man confessed to a similar error, though he pointed out that it's one you're unlikely to make again with 335bhp beneath your right toe. Quite. To the autostrada, the toll booth, and a chance to test... the electric windows. Yes, because in QPs of old, they never felt committed in their ascents and descents. The driver's door window seemed fine, though, gliding briskly, both down and up. I checked the others too, and they were as swift, though one sounded a bit grinding. Hmm. And onto the dual carriage-way itself. In Italy there's a 130km/h speed limit - that's 81 mph - but ignoring it, with prudence, is possible and so it was that we were able to run the Quattroporte out to 150mph for the odd burst, at which speed it is impressively quiet, has more to come, and feels pretty stable, if not quite as well planted as some German 'bahn stormers.' And it slowed down well too - necessary, with the odd lumbering truck. Curious then, that when we got off the straights and onto the twists, the brakes didn't feel anything like as responsive or progressive. Perhaps they need heat in them. Or perhaps we'd cooked them. One thing's certain though: that pedal feel is much improved. The Maser's body control seems to have improved too, though no great claims are made in this direction. The 'normal' setting of the three-position dampers seemed satisfactory most of the time, allowing less heave over crests than in the last car I sampled. There's a fair bit of roll in hard cornering with this setting, and if the 'sport' setting doesn't arrest this as much as you'd hope, it does batten things down usefully for a hard charge, at the expense of disturbed thumping over pot-holes. 'Soft,' incidentally, is useful on bad urban roads, but that's about it. The Maser handles pretty entertainingly for one quite large, its adjustability in bends helped by the sizable slug of torque that the V8 can deliver. The steering is fairly precise (though the valving makes it feel a little sloppy), grip plentiful in the dry (watch it in the wet - there's no traction-control system beyond prudence) and the car pleasingly wieldy. In the final analysis - indeed, well before you get there - this car has not got the depth of competence that its British and German rivals have, but it's pretty good and, more important, there's a have-a-go bravado in its character that makes it more fun than any of its more sober rivals. Contributing considerably to this is that belter of an engine. 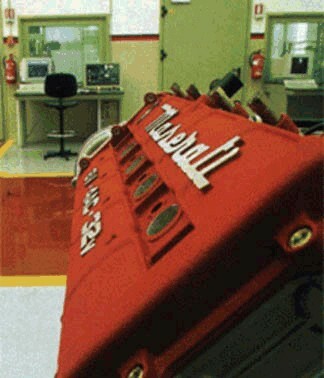 The twin-turbo V8 puts out 332 lb. ft of torque at 4400rpm, but more important is that the turbos spool up with astonishing ease, giving you the grunt of a field full of pigs at almost any speed, and in almost any gear. If you can afford not to think of the fuel you're burning, you'll love this motor. Especially if you give it full throttle in second, when its rapid, hard burble sounds like a NASCAR stocker's motor on a hard charge. 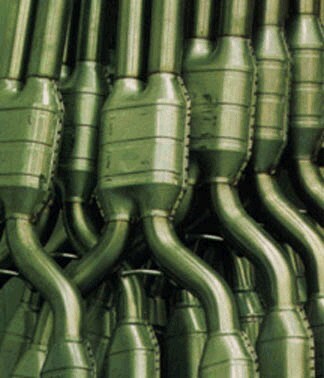 Still, the QP always had the engine on its side. What it has now is a far more convincing feel of solidity, and an awful lot of rough edges burnished off. Granted, the air-conditioning is still pretty feeble (and sounds like an electric hand-dryer on anything over the first speed), the instruments collect reflections like a fashion victim, the buttons in the center console would disgrace a Skoda and the new outside temperature gauge is near impossible to read. Never mind. The list of downsides is now much shorter than it was before. Of course, it's still entirely illogical to buy a Maserati Quattroporte. You'd be much better off with a Mercedes, a Jaguar or a BMW, because they are better cars. They're more modern, more capable and equipped with state-of-the-art systems. Yet they are nowhere near as exclusive and, with the possible exception of the XJR, not half as much fun as the Italian car. When you're about to spend L60,000, however, that is not enough. The crunch, even for those given to the odd irrationally indulgent flurry, will be residual values. And when it comes to Maseratis, the residue doesn't usually amount to much beyond a sinking feeling in the pit of the stomach. The remedy, however, could be at hand, for Andrea Zappia, Maserati's sales director, says that the company is considering offering guaranteed buy-back prices to dull the sting come trade-in time. We have yet to hear how sizable the offer will be, but if it matches a Mercedes', you can enjoy indulging a Maserati with near impunity. And in these days of "samey," slightly soulless execu-mobiles, it's tempting to say what the hell - just do it.